Earlier while editing a few photos from Grace's 3rd birthday, I realized that I haven't posted anything about her 2nd birthday. I'll have to share them with you soon. 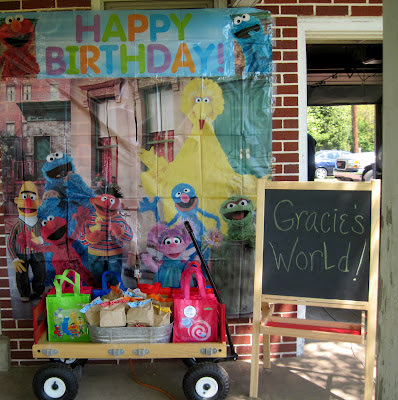 But for now, let's talk about Grace's Sesame Street 3rd Birthday Party! 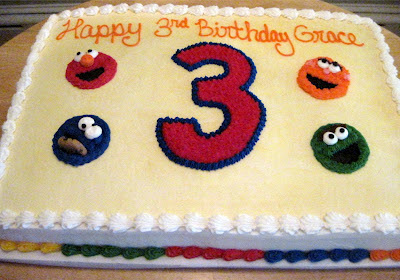 I chose a Sesame Street theme this year since there aren't too many years left where she will ADORE the characters the way she does now. I also figured that this will be my last year choosing the theme of Grace's party. That doesn't mean I won't try to steer her towards themes that I'd prefer! Like Grace's Sweet Shoppe Party, I hand-made the invitations using supplies I already had in my craft room. I was really pleased with the way they turned out, especially since I was running late and had to get them finished in just a few hours! Since the party was outside, I didn't want to spend too much on decorations that would just blow around in the breeze. 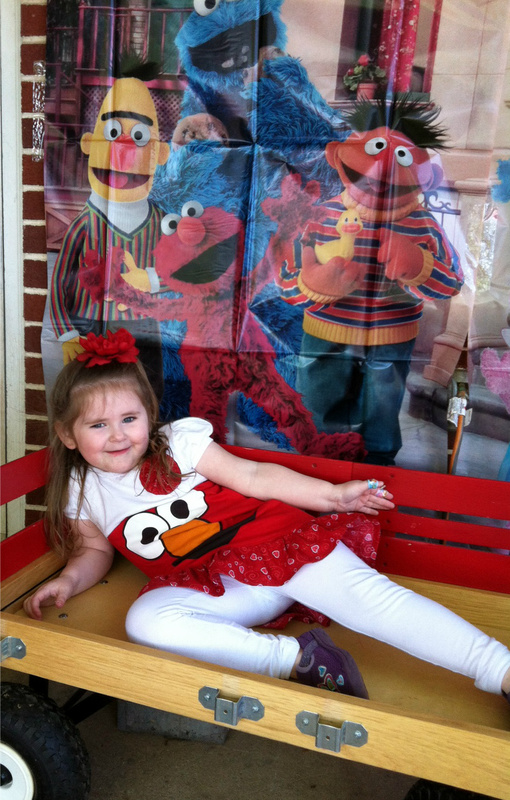 Instead, I picked up a really cool Sesame Street scene setter that we hung our back patio. And since Grace loves to watch Elmo's World, I decided to use her easel to write a birthday message for her on the white board side. But in the end, she liked "Gracie's World" better. I then filled Grace's wagon with the favors for the guests. 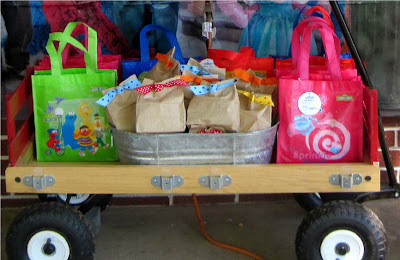 For the toddlers, we filled Sesame Street tote bags with sidewalk chalk, cookies, ring pops and assorted Sesame Street favors including rubber duckies. 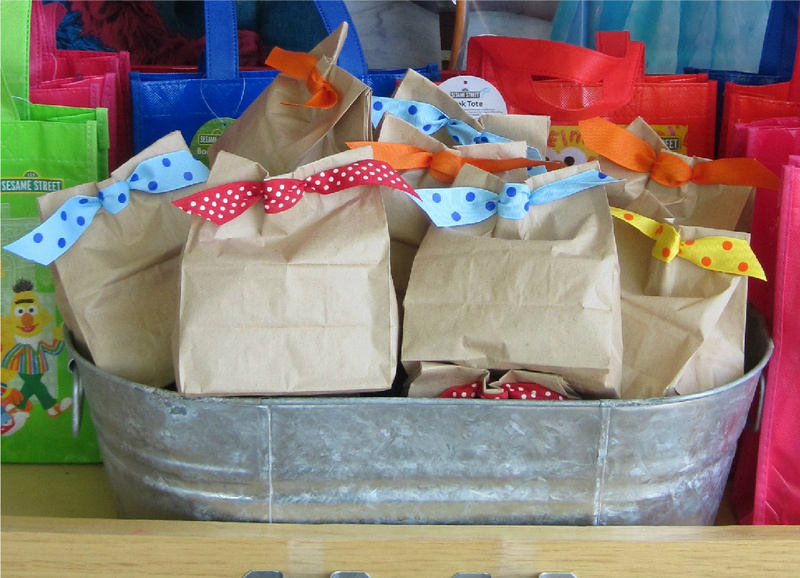 For the tweens and teens, we made smaller favor bags using paper lunch sacks that I tied using ribbon that coordinated with the invitations. Deciding on a cake was the most difficult part of planning this party. A year ago, I saw that one of my cousins made the most adorable Elmo cake and character cupcakes, but it turned out she was out of town the weekend of the party. So, I looked and looked and really had a tough time finding a cake that I liked. We were really pleased with how it turned out and Grace really enjoyed seeing her favorite characters on her birthday cake! Every year, for Grace's party, I dress her in something festive. The birthday t-shirts on the Carter's website are great paired with a colorful tutu! 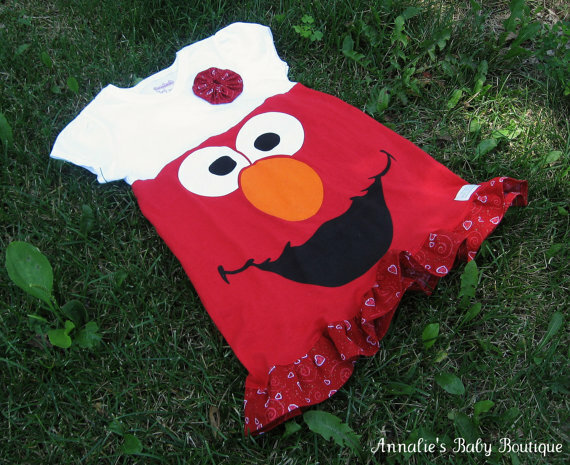 This year, I found the perfect dress for Grace from Annalie's Baby Boutique on Etsy and knew right away that I wanted her to wear it for her Sesame Street party! Here, Grace is posing for a picture in her wagon. The front of her dress is a bit scrunched up, hopefully my sister-in-law managed to get a better photo of her in her dress! In the past, the weather has always been warm for her party. I planned on running around barefoot with a pair of white shorts under her dress. But, it turned out being chillier than I anticipated. Luckily, I had a pair of white leggings for her to wear under her dress. 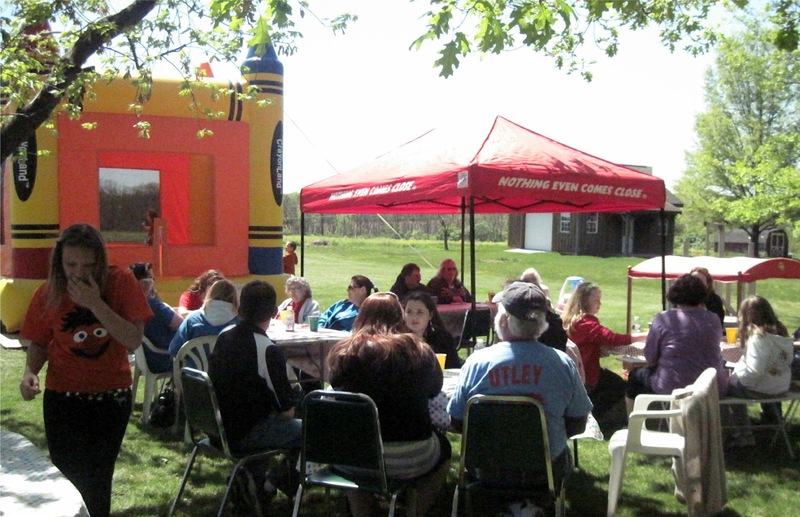 And instead of shoes, she wore slippers so she could keep them on in the bouncy house. I wish I would have thought ahead and purchased Elmo slippers! 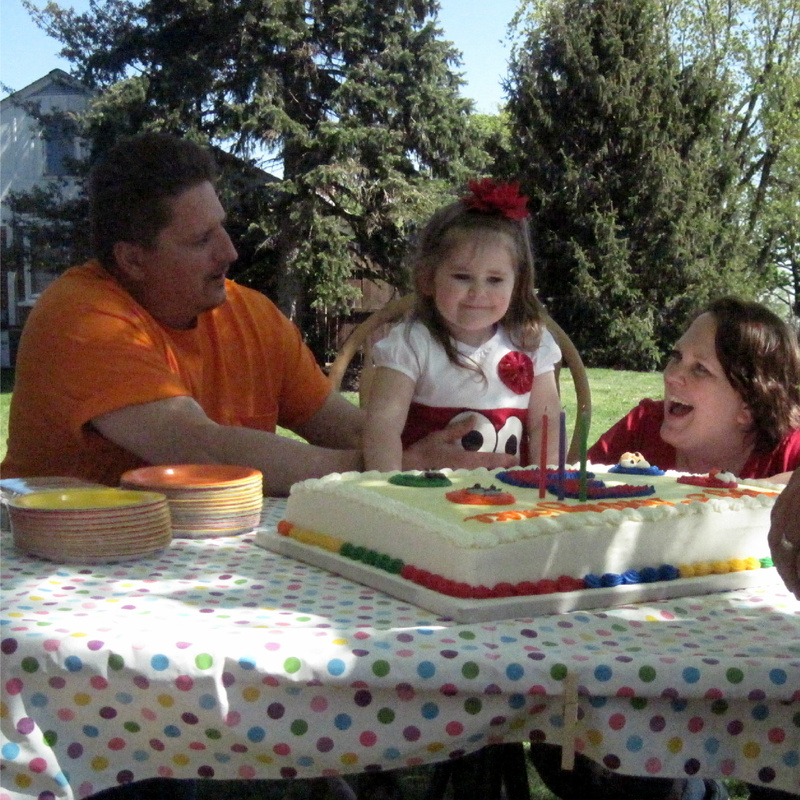 Grace had a wonderful time with her family and friends! Joe and I really enjoyed watching her play and interact with everyone! While she's always enjoyed herself at her other parties, this was the first year that she knew that this party was ALL ABOUT HER! Very cute! I'm sure she enjoyed the party. 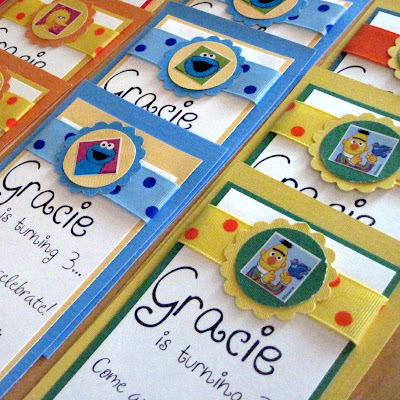 I especially love the simplicity of the invitations! Thanks for stopping by my blog.